Make sure that your business or event gets promoted with these top quality vibrantly coloured posters. Place them on walls where they can't fail to be noticed to ensure that your ventutre is a success. Where do I use my Printed.com voucher code? Grab a code from NetVoucherCodes and follow our link to the Printed.com website. Choose the print product you would like and select your design options. Go through the checklist to make sure your order is correct, then upload your artwork. At the basket stage before you pay, enter your code into the box provided before completing your order. "Enjoy great savings on the Printed.com homepage." "Save money on your orders with the rewards scheme." Printed.com offer businesses and individuals alike a revolutionary professional digital print service that values customer satisfaction above all else. With Printed.com promo codes you can save a bundle while easily creating your own business cards, leaflets, stickers, bound documents, cards, posters, stationery and more by simply choosing the product you want, uploading the material to be printed and selecting your specifications and preferences. 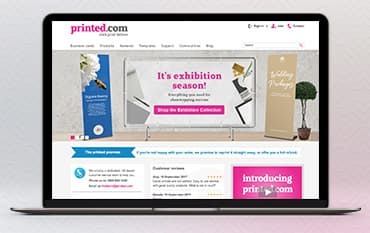 Printed.com will produce your materials to the very highest standard using their start-of-the-art printing technology and send it on to you as fast as possible - and if you’re not completely satisfied with the end product, they’ll reprint it or refund you as per your choice. Whether you’re advertising your business or an upcoming event or maybe you just want to spread the word about something, print it your way with leaflets and flyers from Printed.com. Bring your message to life with high-quality leaflets and flyers and pick and mix to create a print that’s unique to you. Select from 12 paper stocks and add your choice of finishes such as new perforation to create print marketing that reflects all the time and effort you’ve put in. Each promotion you run will be a perfect fit for the job and most importantly it won’t cost a bomb either. If you want to send out a greeting card that’s personalized and specific then use Printed.com to craft something special for your family and friends. Or why not send out a greeting to clients or create your own friendly marketing campaign? Pick ‘n’ mix greeting card papers and finishes mean you can make them your own and with high quality envelopes your greeting card wrapping can look just as attractive as the message and design inside. Do you provide sample packs? Yes. Printed.com provides free sample packs that you can order online using the form. How can I contact Printed.com? Printed.com offer high quality digital printing at affordable prices. Whether you need new Business Cards, Leaflets and Flyers, Stickers or other business items, Printed.com will provide them to you with a fast dispatch time guaranteed. Their product range extends beyond business needs, they also offer low cost Wedding Stationery, including Wedding Invitations, Greeting Cards and Photographic Prints as well as personalised products that give that extra special feel when sending out your gift. We are constantly on the hunt for first order Promo Codes for Printed.com to help you with your money saving. Our experts check dozens of sites for secret codes including NHS discounts, student sites & social media channels saving you time & money!